There are many adventure parks in the Caribbean that allow visitors to enjoy some exciting fun adventure activities in a tropical environment. These attractions are excellent for family and group activities. Five of the islands that offer these attractions are Dominica, St. Lucia, Jamaica Dominican Republic and Curaçao. Moreover, these attractions are located close to major tourist destinations in the different islands which allow them to be easily accessible from the different resorts and hotels that visitors choose to stay. The Wacky Rollers Adventure Park is one of the premier attractions for visitors to Dominica. It is a place filled with excitement and trills in an excellent tropical environment. This attraction is located in the lovely rainforest of Dominica and is accessible by booking arrangements at the various resorts and hotels in the island. This theme park feature an obstacles course containing Duck Walk, Indiana Bridge, Footbridges, Monkey Bridge, zip lines and the exciting Tarzan Jump. This attraction makes a vacation to the island of Dominica even more exciting. Every detail of the course is plan to perfection allowing visitors to enjoy the activities at the attraction in manner that will prevent any form of injury. This is one of the top Caribbean adventure parks that will give you a truly nature island experience of fun in a rainforest environment. The romantic vacation island of St. Luica is another country in the eastern Caribbean that offers adventure park attractions. Treetop Adventure Park is located in Dennery, St. Lucia. The country is home to the world famous twin tower mountains called Gros Piton and Petit Piton. The course can be access from with a days’ journey from any resort location on the islands. Visitors can participate in rainforest hiking, rainforest biking, and Treetop Canopy Adventures. There are many St. Lucia hotels that allow visitors to enjoy this lovely attraction. This adventure park in the Caribbean island of St. Lucia attraction offers three types of activities. These are waterfall hiking, jeep safari and zip lining. 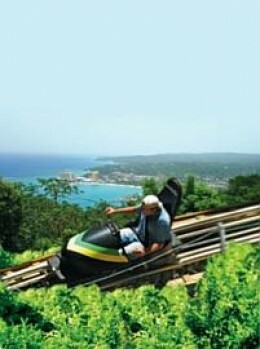 This is one of the top adventure parks in the Caribbean and is located in the resort area of Ocho Rios, Jamaica. Visitors can participate in activities on a cruise visit, or from other top destinations in the island such as Kingston, Montego Bay, Runaway Bay and Port Antonio. The park provides some exciting adventures that will be in your memory for a long time to come. Visitors to the park will be able to enjoy bobsled rides, canopy zip line, mystic waterslide and SkyEplorer. This is a great adventure for family and group visitors. Close to the Kingston in Jamaica you will find Sun Coast Adventure Park. This is a park for the fun loving visitors who lovely lots of different activities. The park offers activities which includes paintball (the largest in the island), mini golf, swings, soccer, volley ball, hiking, rope challenge course, maze, three-leg-race, dominoes and other extreme sports. These activities are excellent for families and groups. Visitors to the capital of Kingston can easily get access to this park. This is a place that promises a lot of fun in an environment that is really relaxing. This attraction is one of the Dutch Caribbean finest water sports activity options. The park is a great place of family visitors traveling to Curaçao. One of the amazing features is its location. It is located on the seafront which allows it to have healthy coral reef which makes a unique marine attraction. The park features three main components for guest. These are educational, information and interaction accesses of it offering. A days’ activity will see guest participating in several tours, listening to presentations and have face to face interactions with different species of animals. The location also provides underwater expeditions, fascinating encounters with animals while swimming snorkeling and diving, and exciting boat trips to neighboring islands. This is a adventure parks in the Caribbean that must be visited. The Ocean World Adventure Park is located in the Dominican Republic. This is one of the largest attractions of its kind in the world. The attraction offers over 52 different forms of activities daily with exciting interactions with different species of animal. This park is the largest man made attraction for dolphins in the world. Visitors have the option of participating in activities which includes interacting face to face with lions, dolphins, sharks, amazing species of birds, tigers, spending time in a tropical forest and on the beach and enjoying lovely restaurants and bar. The facility is great for family, group and romantic guest. It provides a great experience of visitors would loves water sports adventures. This is one of the top theme parks in the Caribbean.